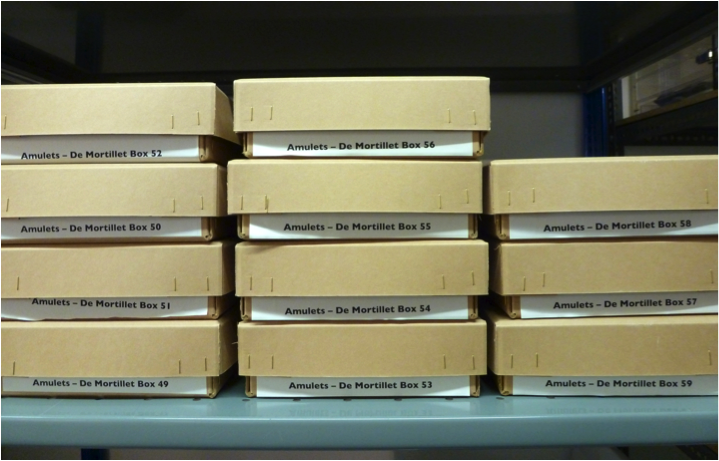 As we come to the end of the project and the amulets are nearly ready to be put into storage, I thought it would be interesting to reflect on some of de Mortillet's own storage methods and how they differ from those we use in the Museum today. At first glance the containers that he stored some amulets in appear to be utterly random, perhaps things that he simply had lying around his office or house. However, on closer inspection, you begin to ask, 'are they'? Some amulets have been stored in cardboard pen-nib boxes. For example, this one contained ten discs of bread or ‘small loaves’ with religious figures moulded onto them from Copacabana in Bolivia. 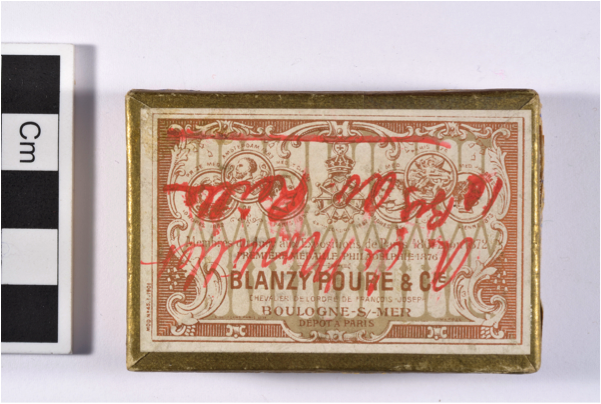 You can easily imagine that de Mortillet would have had several pen-nib boxes on his desk. In addition, they are well suited to housing small amulets! 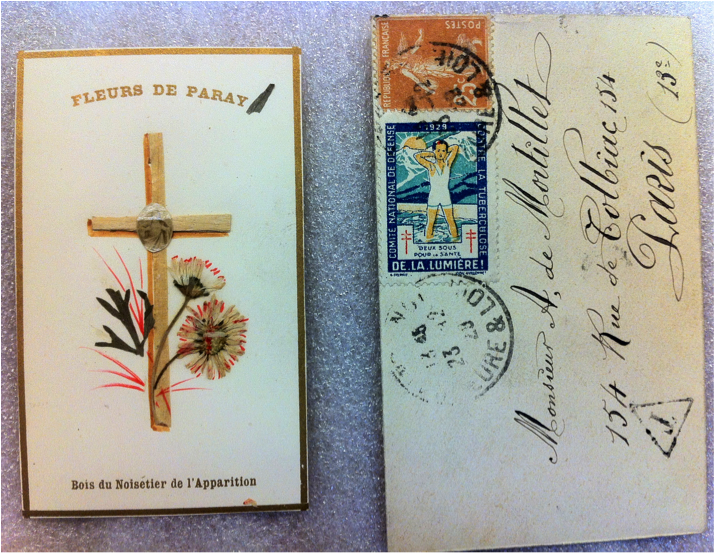 We've also found a number of amulets inside envelopes, such as this one here, addressed to ‘Monsieur A, de Mortillet’ written in beautiful handwriting and with a wonderful stamp on it. 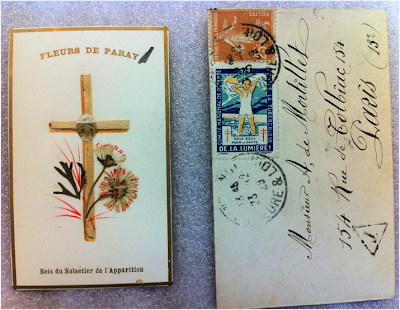 The envelope contains a religious picture made from daisies and wood from the hazel tree where Christ appeared to St. Margaret Mary of Alacoque. Again, it's more than likely that de Mortillet would have had an abundance of old envelops that he could slip amulets into. 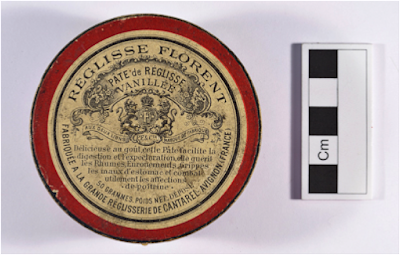 However, it's striking how many pharmaceutical or medicinal boxes and glass vials de Mortillet used as storage containers, and I would suggest that this is significant. Many of the amulets in the collection have medicinal qualities and have connections with health issues. Therefore, the choice of these objects to store some of the amulets becomes less random, even though the objects are not directly related to the containers they are stored in. We can only guess at what de Mortillet’s actual intentions were. Firstly, lots of objects are stored in glass test tubes, vials or jars. This test tube with a cork stopper contains seven fragments of shell from Algeria. 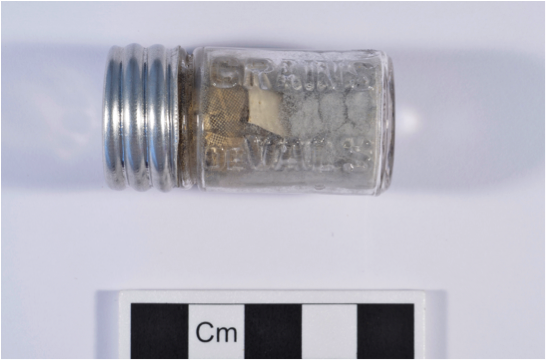 And this glass 'Grains de Vals' jar contains lead pellets from the Holy Land, yet it would originally have contained herbal medicine for constipation. Grains de Vals have been a used as medicine for a long time (as both the jar and this advertisement from 1934 suggest), and they are still sold today. There is also a ‘Le Rénïol’ metal tin containing eleven iron pyrite crystals. 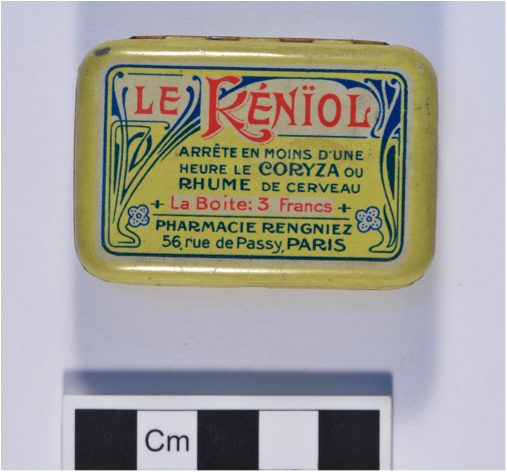 The box would originally have contained pills or small pastilles for a head cold made up by 'PHARMACIE RENGNIEZ, 56 Rue de Passy, Paris'. We use different packing practices in the Museum today to ensure that objects are stored in a stable environment. 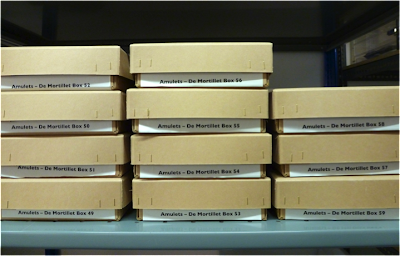 The amulets are stored in acid-free boxes, which are lined with jiffy foam (a neutral packing material). Each amulet is placed in it’s own individual sealable plastic bag, which can also be lined with jiffy foam if an object is a little bit fragile. We stack the objects in the boxes with the heaviest items at the bottom, and it’s important not to overfill them. It is essential to label each box and to make a corresponding note about the location of each object on the computer database so that we always know where it is and it can be found easily. De Mortillet used a range of containers to house the amulets he collected. They often seem merely random or expedient, but they are incredibly interesting objects in their own right and some are visually very appealing. 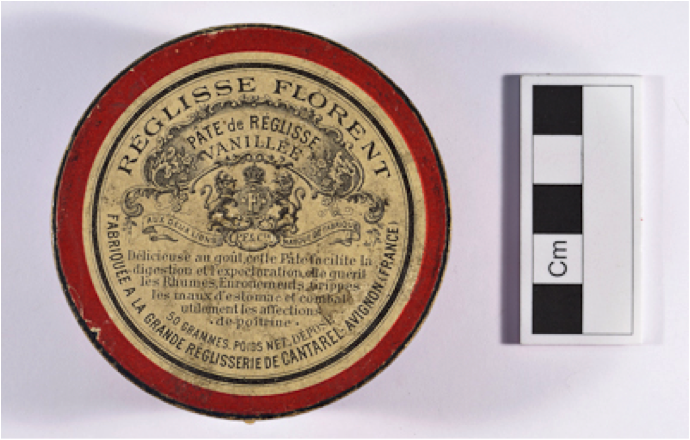 On one level they provide insight into the type of things, especially pharmaceutical items, common to French households at the time. 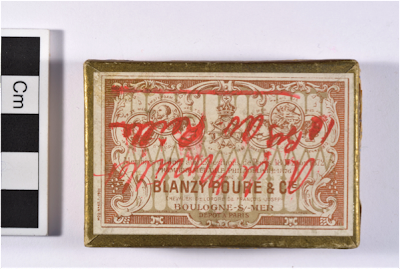 But on another level, if the use of these medical boxes and glass vials was intentional, perhaps de Mortillet was trying to say something much more significant? Discovering what his intentions were might help us to understand more about his motivations for collecting certain objects.